In the movie “Yoga Woman,” Tari Prinster tells the moving story about her struggle with cancer and how yoga helped her heal and recover after the treatment. Tari has since become a leading force in teaching yoga to cancer survivors, and she was recently awarded with Yoga Journal’s Seva Award for her pioneering contributions to yoga through her y4c training program. 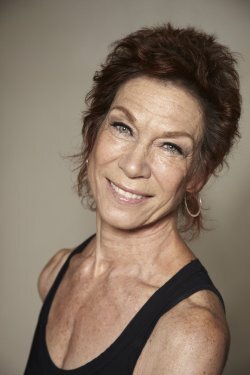 In this interview with YogaU Online, Tari talks about her own journey and the steps that led her to develop yoga programs targeting the specific needs of cancer survivors, and why movements that emphasize gentle detoxification and strengthening of the lymphatic system may be far more important than a more restorative form of yoga. YogaU Online: Most people know you from the movie “Yoga Woman,” where you tell the very moving story of your own struggle with cancer and how yoga helped you join your fight with cancer as well as with your ongoing healing afterwards. Could you talk a little bit about that? Tari Prinster: When I was first diagnosed with cancer and began my treatments, yoga provided me with a way of managing all the fears I had. Surgery for breast cancer creates a high risk of what’s called lymphedema. And that’s a lifelong risk, so I was quite nervous about that possibility. But then when I began my chemotherapy treatments, yoga began to provide an additional benefit: it felt like it was helping me to flush the toxins out of my body as quickly as possible. I had adapted my practice to the changing environment of my body as I was going through these treatments, and I began to notice that my body was responding: it felt like it was helping me stay balanced and positive both in my mind and in my physical health. My doctors even commented and said, “Wow, we’re giving you some pretty heavy duty stuff here and you’re not getting the usual kinds of side effects that we see in other patients that we’ve had.” They had an expectation that I was going to be far more fatigued than I was. So, that made me think that maybe my daily yoga practice was helping with that. YogaU Online: That’s a pretty big deal, that they actually noticed a difference. Tari Prinster: Yes. And of course, I said, “Look, I'm doing yoga every day. Is that okay?” And it’s important to understand that this was fifteen years ago, when we knew a whole lot less about the effects of yoga on someone who is going through cancer. The doctors were basically were clueless. They had no idea of why one would or wouldn’t want to do yoga. And that inspired me to find out what was going on: why yoga was making me respond to the chemotherapy better than what was expected. YogaU Online: How did you go about finding out the answers? Tari Prinster: I first brought the question to the yoga community. How is it that yoga helps? What is it doing for me? Is there anything I should do more of as someone who’s going through cancer treatments? I also started looking into the science behind the yoga, asking questions and doing research. And I discovered there was very little knowledge both on the yoga side and on the medical side as to what was going on. So I started looking into the biological level of what was happening in the body when we use the actual physical mechanisms of yoga—for example, a twist or an inversion. When we make a statement as yoga teachers that a particular pose detoxifies the body, what does that actually mean? What is going on in my body to eliminate toxins? And what is happening on a cellular level in my body as a result of the physical mechanics of yoga? And the answer lies in understanding that the chemistry of our body, as far as cancer is concerned, functions primarily through the circulatory system and the lymphatic system. And it’s these two systems that both bring nutrients to the cells of the body and cleanse out toxins from our body. It’s through these systems that we keep the cells of our body alive and happy and healthy. YogaU Online: So it was on that physical, cellular level of nurturing and cleansing that you researched? Tari Prinster: Yes. You see, every human is a conglomeration of an average of seventy-five trillion cells. And every single one of those cells in our body goes through a life cycle. The cells that we have in our body today are not the same as they were ten years ago. It’s a natural process for each of those seventy-five trillion cells to die off and be replaced. And our lymph system is the garbage disposal: it’s constantly getting rid of dead cells in our body, which is a natural process. So a normal cell that lives and functions well and then dies. But a cancer cell doesn’t die: a cancer cell is a cell that continues to grow in the body. It’s our lymphatic system’s job to try to flush those cancer cells out of our body, and that’s what chemotherapy and other cancer treatments try to do, too: identify cancer cells and then flush them out. And so I wanted to find out how that process works, and how yoga can help facilitate it. YogaU Online: What did you discover? Tari Prinster: I discovered that through the movements of yoga, the diaphragm actually massages our lymphatic system with every breath that we take. And so, when we use controlled breathing, or Pranayama, we are actually massaging the lymphatic system. And when we move the muscles of our body, we are also stimulating the lymphatic and cardiovascular system in ways that help to nurture and to detoxify the body. And then of course, we have the wonderful mechanism of what Mr. Iyengar called the “squeeze and soak” technique of the twist, which functions to wring out, as you would a washcloth, the internal organs. And then of course, we have the inversion process, which uses gravity to stimulate and move lymph through the body. And so, it’s by understanding and using all these tools we have in yoga, and changing my practice to consciously cleanse my body, that I was able to detoxify during treatment and keep my immune system strong to avoid recurrence. YogaU Online: That’s powerful, Tari. And knowing your style as a yoga teacher, I can see how this knowledge comes into play. Tari Prinster: Yes, It’s one of the things that distinguishes my approach from other approaches that have evolved to manage cancer through yoga. With the stress and anxiety of a cancer diagnosis, everyone needs to relax. But my approach is that just being relaxed is not enough for someone who is dealing with cancer, because the real healing takes place when we begin to move. Our bodies are designed to move. And when you look at how cells are constantly being nurtured and cleansed through the cardiovascular and lymphatic system, both of those systems in our body involves movement. The heart is constantly moving blood through our body. We need to encourage that. And the lymphatic system moves fluids, too. We need to keep all these fluids moving. It starts with the breath. As I described before, just the diaphragm movement alone will improve circulation. This creates a way for anyone in any place in their practice or treatments to begin to reenergize. So we start there and then combine that with the simplest of movement. And as that grows, you start to feel inspired. I’ve seen it happen all the time: a student will come in and say, “Oh, I just had a treatment this morning or yesterday and I'm not feeling so good.” And I’ll say, “Well, just come in and sit down and just be with us.” And then we’ll start very slowly with the breath. And sure enough, within a short period of time, that movement of the breath then turns into movement of the fingers and then the fingers into movement of the hand and the arm and it takes no time at all that everyone is moving all parts of their body. It builds confidence. There’s a feeling of, “Look what I thought I couldn’t do today, and wow, look what I am doing.” And that continuous movement, that Vinyasa, makes it even more possible to then rest and completely relax. The beginning of my approach is breath and movement and not just a restorative relaxation (which is a wonderful thing to do). But everyone needs to move. YogaU Online: This is a great point you’ve made about the lymphatic system because, unlike the cardiovascular system, it does not have a dedicated pump. As you pointed out, it’s that movement of the muscles and the diaphragm that creates that return flow. And I would imagine, particularly for people undergoing a cancer treatment, that taking care of that lymphatic function and keeping the fluidity level just makes a huge difference. YogaU Online: So after you went through your own treatment, your own healing, what inspired you to teach this yoga to others who were dealing with cancer? YogaU Online: What sort of feedback do you get from your students? Tari Prinster: The feedback comes in that they come back to class. They want more classes. When they feel the progress in themselves, they want to then go further. Sometimes they’ve never done yoga before, and they’re terrified of moving their body, but still curious. They’ve heard that yoga is good for them. And mostly what they hear is that yoga is going to be a wonderful way to relax and to feel spiritually hopeful. And they find out that not only does it do that, but that their body is getting stronger as well. And that creates a certain kind of energy that is way beyond what they had expected. They see their bodies change, and they want more. The most wonderful thing for me is to have someone come to me and say, “You know, I’d really like to step to a different level of a yoga practice. Do you think that it would be okay for me to take regular yoga classes instead of just yoga for cancer classes? Also be sure to check out Tari's course on YogaUOnline with a video yoga practice for cancer survivors: Introduction to Yoga for Cancer - Tapping into the Body's Inherent Healing Wisdom.